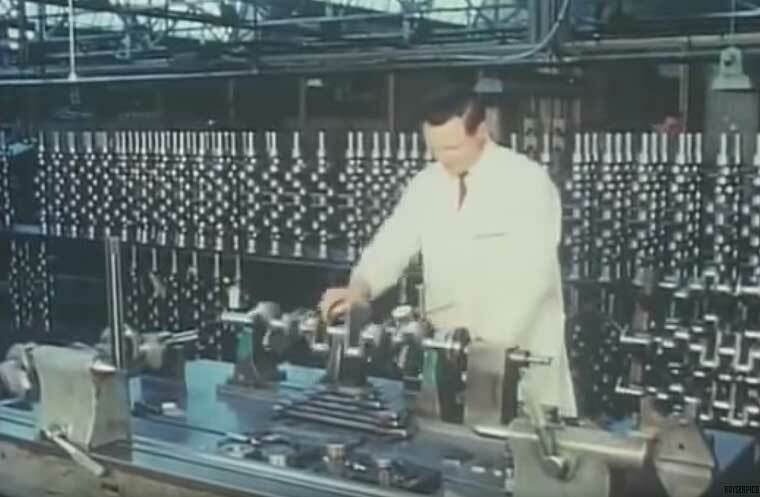 We haven’t come across any good vintage films lately covering factories and assembly plants, although this one produced in 1961 takes you on a captivating tour of manufacturing operations and the assembly line at the Jaguar plant located in Coventry, England is well worth the time to watch. In this video of a film produced for Jaguar Cars Limited a commentator, who is a Jaguar service engineer (mechanic) will take you on an interesting tour of: engine manufacturing operations, assembly line for the power plant, the “saloon” (sedan) paint shop, and installation of body fittings and trim. Next up is the body drop, and the final assembly line where: the car is started for the first time and then driven to the interior trim shop, there the leather hides are cut and sewn, the interior is installed, finish trim is added, and followed by two test drives, final tuning and adjustments. At the end of the film, the commentator is taken out for a “spin” by a Jaguar representative in a bright red E-Type Series 1 sports car that was placed on the market earlier in 1961. Share with us what you find of interest in this interesting video. This entry was posted in Auto photos 1946 - 1965, video. A great film. Thank you. The accent and famous Jag exhaust note are music to my ears! I’m astonished at the amount of care — the constant inspections, the balancing and rebalancing — that went into every engine. Even when parts are being machined automatically, each part is loaded by hand into the machine. Seeing how labor-intensive the process is, I can understand how even the beginnings of automation began to eliminate jobs. Amazing study, watching real craftsmen feel and hear what needs to be done. Thank you for a magnificent presentation. This film was fascinating to watch from the standpoint of true craftsmanship and its inefficiencies. Charlie Sorensen would certainly have run rampant in that factory streamlining processes, increasing production numbers, and lowering costs. The high level of human attention to detail and skill seems to have moved from yesterday’s automobile factories to today’s meticulously run restoration shops. And yet, modern vehicles are so much more reliable and of high quality. Most moderns just lack the soul of the old cars. Really enjoyed this film. 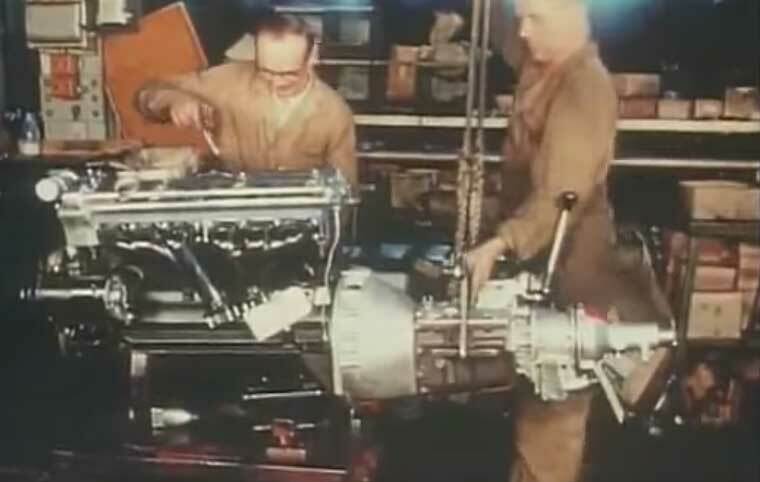 I loved this.Those engines were beautiful.So that’s where our ’62 Mark whatever it was came from. …..but there was a high price to be paid.Paid to Lucas,Lord of Darkness. That and I heard the carbs were always going out of sync.Can anyone out there vouch for that? I guess Lucas was the ONLY automotive electrical co. in England so they got chosen by default.Gotta buy local by law,of course. And so many people worked there and it was a union shop!Flabbergasting. And them polished valve covers! Cam covers actually. There are two cams, driven by a long “silent chain”. Adjusting the valve clearance involves: removing the covers from the (cold) engine and measuring the clearance of each tappet. This involves turning the engine through two revolutions, and taking measurements every 120 degrees. Then you take both cams out and change any shims under the tappet cups that needed adjusting; you wrote those original numbers down, right? Put everything back together and recheck the clearances. If all is good, drive it for an hour or so. Then, tomorrow (when the engine’s nice and cool) measure the clearances again. Lucas made good equipment for most of it’s lifetime, the bad stuff was very late. And, if the carburettors were set properly and LEFT ALONE they stayed that way. The earlier Jags, and other cars with Skinner Unions, had a “cold start device” – an electric heat coil in the manifold and a tiny fuel jet to dribble fuel on it. Adjusting the valves on a DOHC Suzuki 4 was pretty easy compared to what was mentioned above. All one needed was a special tool that would compress the valve springs to allow different sized shims to be inserted. Still have that special tool around somewhere. As for the Prince of Darkness, as far as I have experienced, the nickname was all to apropos, even in earlier iterations. My MGB buddy would have to pop the hood in thunderstorms to dry one thing or another out before moving off again and the Lucas stuff on early 60’s Brit bikes was pretty bad. Ducati had a bad rep for reliability of its electrical systems of Italian origin, but became much more reliable when they started using Japanese components in their SS lines, etc. of the early 90’s. My first sighting of an E-Jag was unforgettable, having no idea who made that space vehicle! MGB is really well into when the Lucas reputation started down. Early means 1920s through to after the war. Early (as mentioned here) was actually pretty good. Great film. I’ve toured two car factories in the last few years — Morgan and Volvo — and Jaguar in 1961 is reminiscent of Morgan now, just on a larger scale. The craftsmanship is wonderful, as others have noted, but the scenes in the Jaguar paint shop with rudimentary vapor masks and no eye protection are downright scary. Especially enjoyed the road-test scenes on country roads around Coventry.